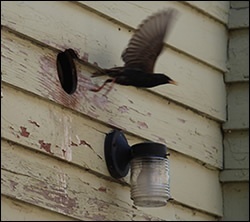 Birds can become a problem when they infest an attic or sometimes enter a vent. Many times they nest in a dryer vent or bathroom vent. This is a very common problem. Birds are not destructive like a raccoon but the mess they leave is a real problem. Birds are often carriers of parasites and histoplasmosis. Those who have asthma problems are at higher risk from birds and their droppings. Histolplasmosis in bird feces can actually be deadly to humans.